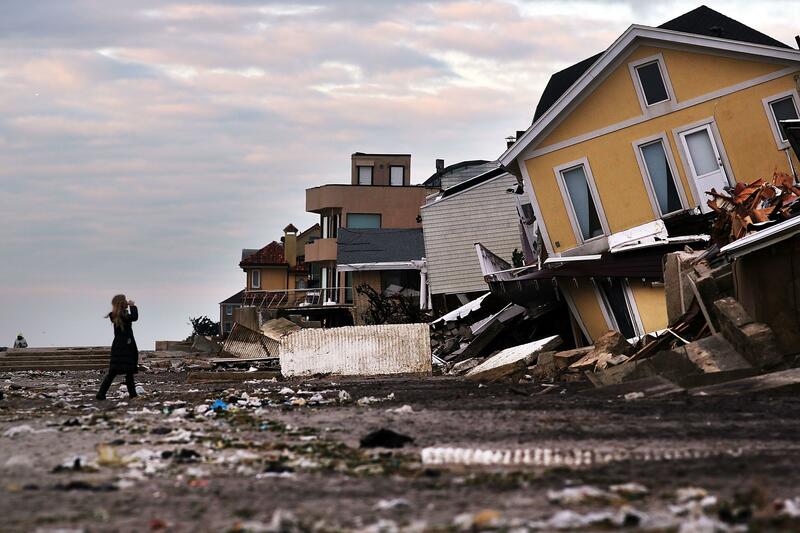 Hurricane Sandy's aftermath is worse than you think: Photos of the devastation. It’s worse than you think. Photos of the devastation. A view of a partially powered Manhattan November 1, 2012 in Hoboken, New Jersey. 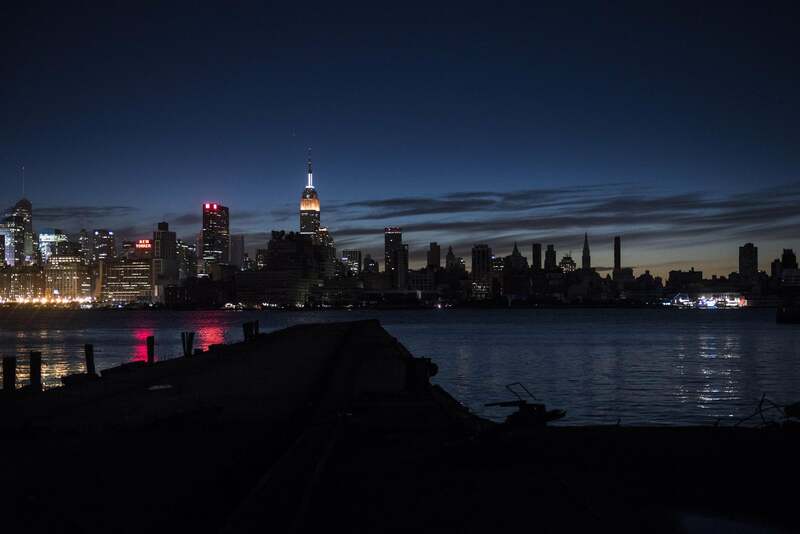 Hurricane Sandy, which made landfall along the New Jersey shore, left parts of the state and the surrounding area without power including much of lower Manhattan south of 34th Street. 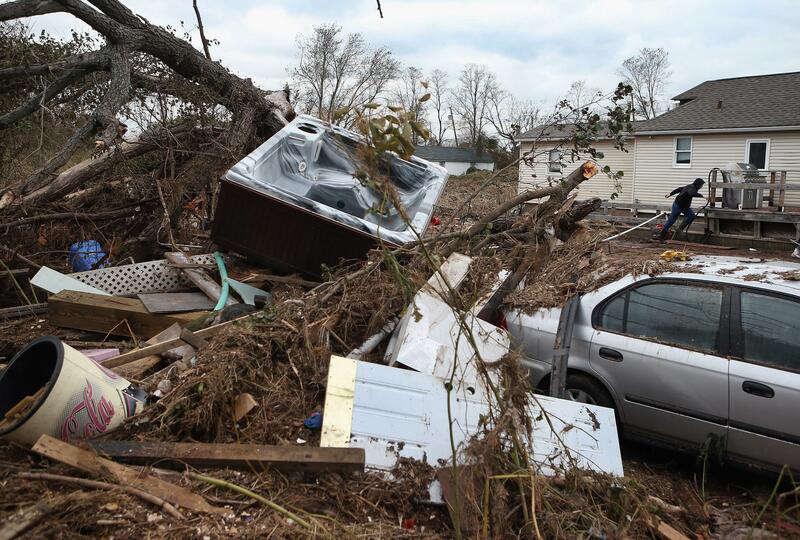 A hot tub lies in a pile of debris on November 1, 2012 in the Ocean Breeze area of the Staten Island borough of New York City. 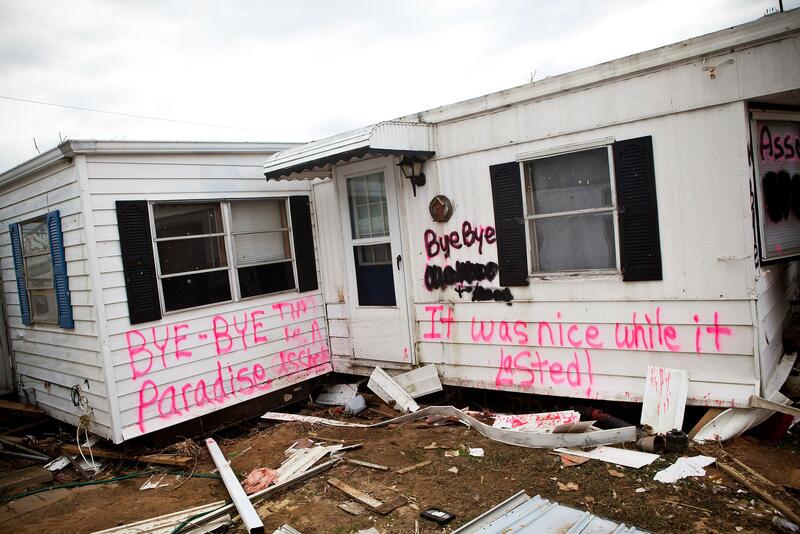 Most homes in the seaside community were inundated by the ocean surge caused by Superstorm Sandy. The roller coaster at the Casino Pier in Seaside Heights, NJ on Thursday. 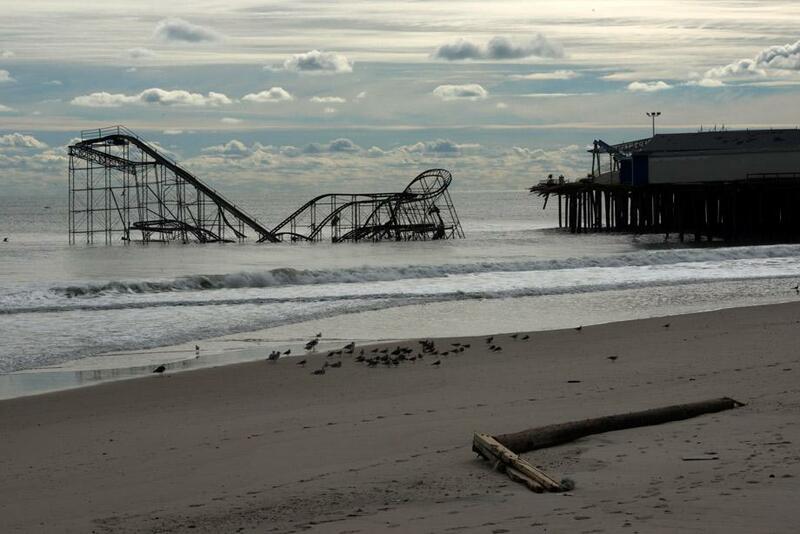 The boardwalk was destroyed by Hurricane Sandy. Photo by Bonnie Jo Mount/The Washington Post via Getty Images. LONG BEACH, NY - OCTOBER 31: Robert Justh drags a hose while attempting to drain a flooded basement, caused by Hurricane Sandy, on October 31, 2012 in Long Beach, New York.The storm has claimed many lives in the United States and has caused massive flooding across much of the Atlantic seaboard. U.S. President Barack Obama has declared the situation a ‘major disaster’ for large areas of the U.S. east coast, including New York City, with widespread power outages and significant flooding in parts of the city. NEW YORK, NY - NOVEMBER 02: A woman walks along the beach in the heavily damaged Rockaway neighborhood, in Queens where a large section of the iconic boardwalk was washed away on November 2, 2012 in New York, United States. Limited public transit has returned to New York and most major bridges have reopened but will require three occupants in the vehicle to pass. With the death toll currently over 70 and millions of homes and businesses without power, the US east coast is attempting to recover from the effects of floods, fires and power outages brought on by superstorm Sandy. MANTOLOKING, NJ - OCTOBER 31: Homes sit in ruin at the end of a bridge wrecked by flooding from Hurricane Sandy on October 31, 2012 in Mantoloking, New Jersey. 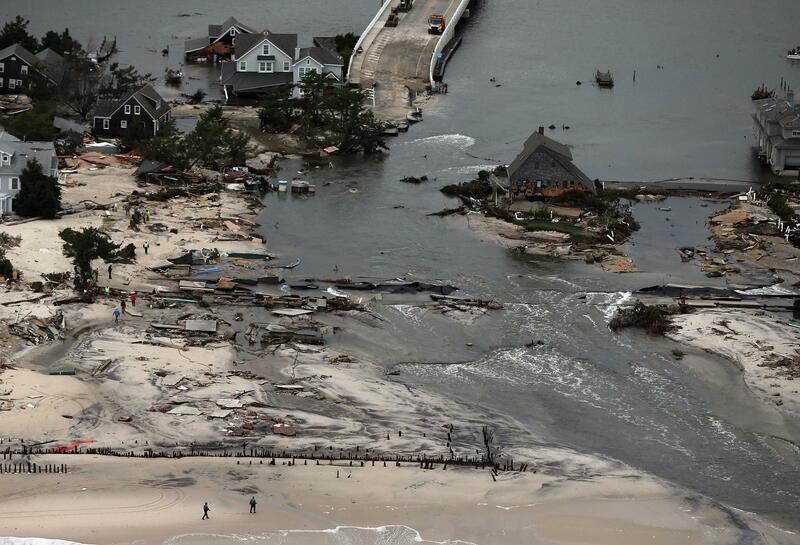 At least 50 people were reportedly killed in the U.S. by Sandy with New Jersey suffering massive damage and power outages. HIGHLANDS, NJ - NOVEMBER 01: An abandoned trailer home, with the words, ‘Bye-bye Paradise, it was nice while it lasted,’ spray painted on its side, is seen in the Paradise Park trailer Park on November 1, 2012 in Highlands, New Jersey. Superstorm Sandy, which has left millions without power or water, continues to affect business and daily life throughout much of the eastern seaboard. HIGHLANDS, NJ - NOVEMBER 01: Clifford Seay helps his girlfriend, Regina Yahara-Splain, clean out her home, which was damaged by Superstorm Sandy, on November 1, 2012 in Highlands, New Jersey. Superstorm Sandy, which has left millions without power or water, continues to affect business and daily life throughout much of the eastern seaboard. NEW YORK, NY - NOVEMBER 01: Water continues to flood a neighborhood on November 1, 2012 in the Ocean Breeze area of the Staten Island borough of New York City. 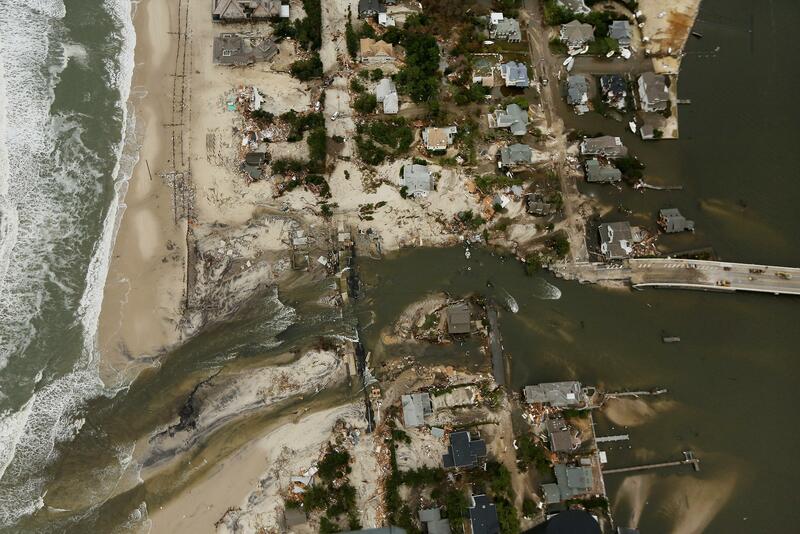 Most homes in the seaside community were inundated by the ocean surge caused by Superstorm Sandy. NEW YORK, NY - NOVEMBER 01: Parts of a fallen tree dangle in front of the Williamsburg Bridge, lit on the Brooklyn side (L) but darkened on the Manhattan side on November 1, 2012 in New York. 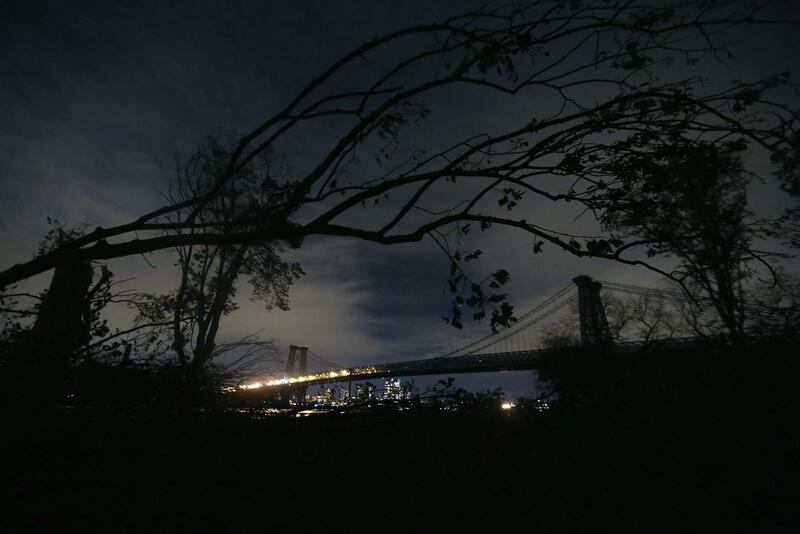 Most residents of Lower Manhattan remain without power following Superstorm Sandy. Lower Manhattan residents should have power restored Saturday while most others in the city should have power by November 10 or 11. 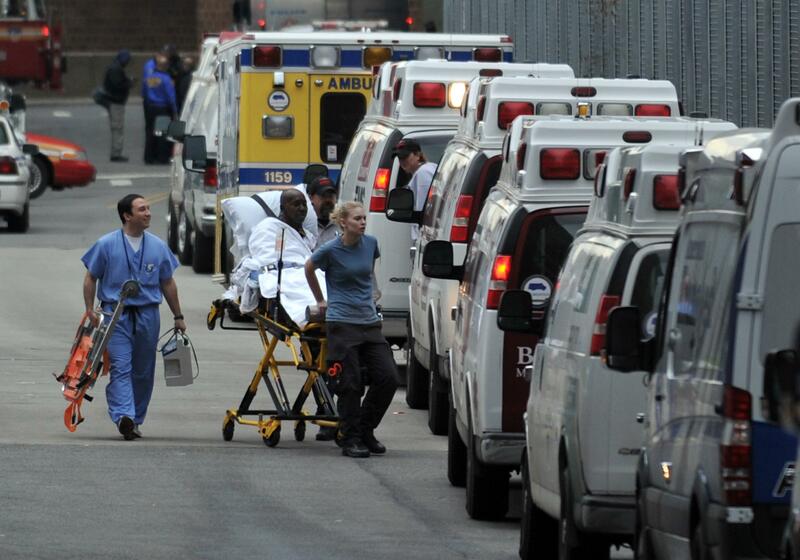 A patient is evacuated from Bellevue Hospital on October 31, 2012 in New York. The hospital had been operating on backup generators since losing power during Hurricane Sandy but had to be evacuated once the extent of the damage became clear. 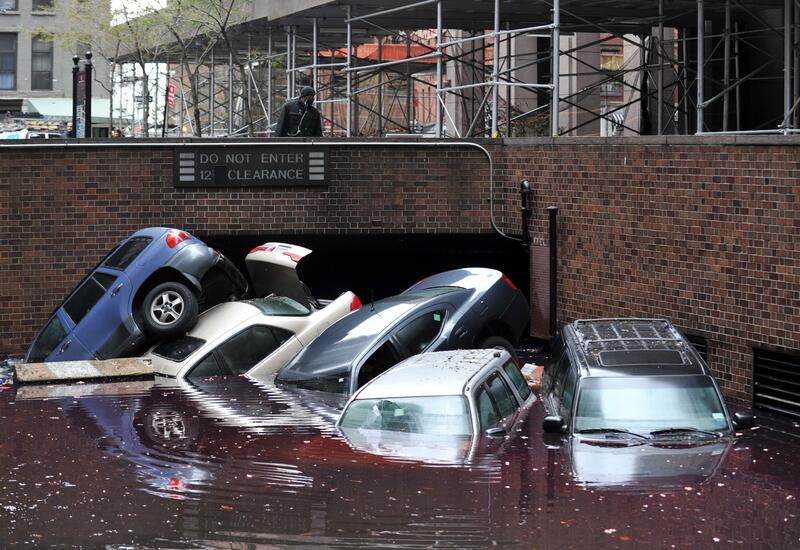 Cars piled on top of each other at the entrance to a garage on South Willliam Street in Lower Manhattan October 31, 2012 in New York as the city begins to clean up after Hurricane Sandy. 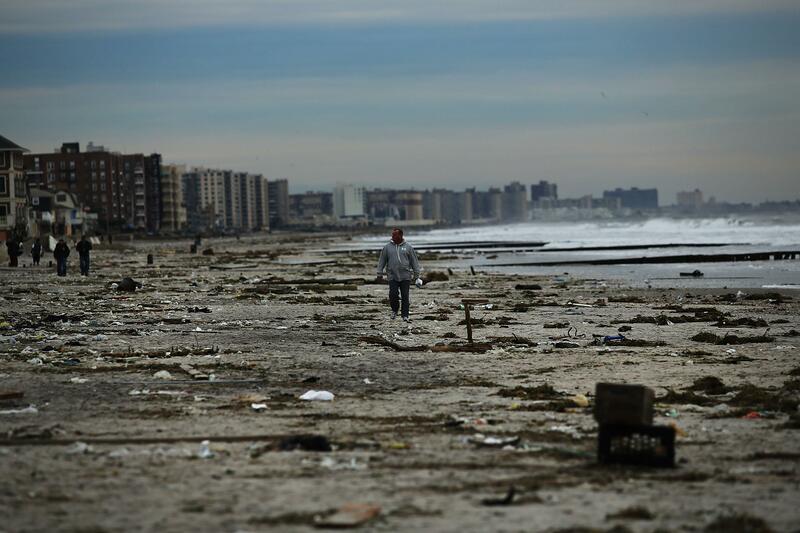 A man walks along the beach in the heavily damaged Rockaway neighborhood, in Queens where a large section of the iconic boardwalk was washed away on November 2, 2012 in New York. Limited public transit has returned to New York and most major bridges have reopened but will require three occupants in the vehicle to pass. With the death toll currently over 70 and millions of homes and businesses without power, the US east coast is attempting to recover from the effects of floods, fires and power outages brought on by superstorm Sandy. Homes sit in ruin at the end of a bridge wrecked by flooding from Superstorm Sandy on October 31, 2012 in Mantoloking, New Jersey. 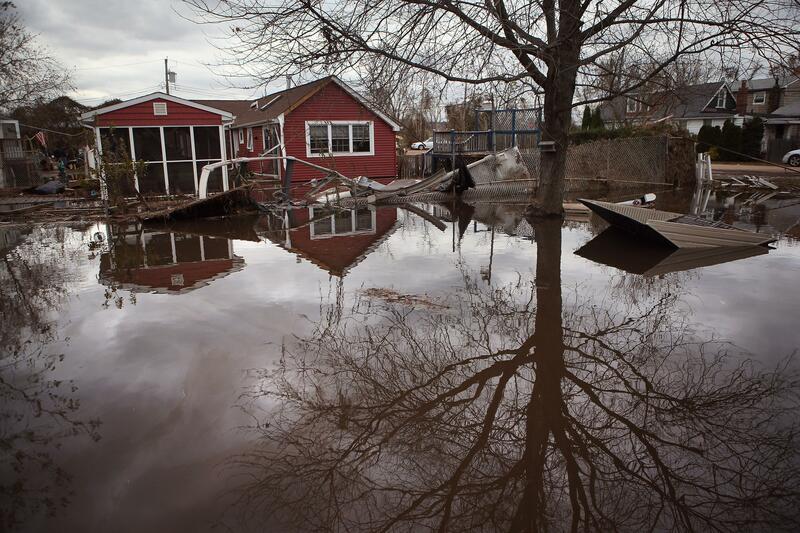 At least 50 people were reportedly killed in the U.S. by Sandy with New Jersey suffering massive damage and power outages. 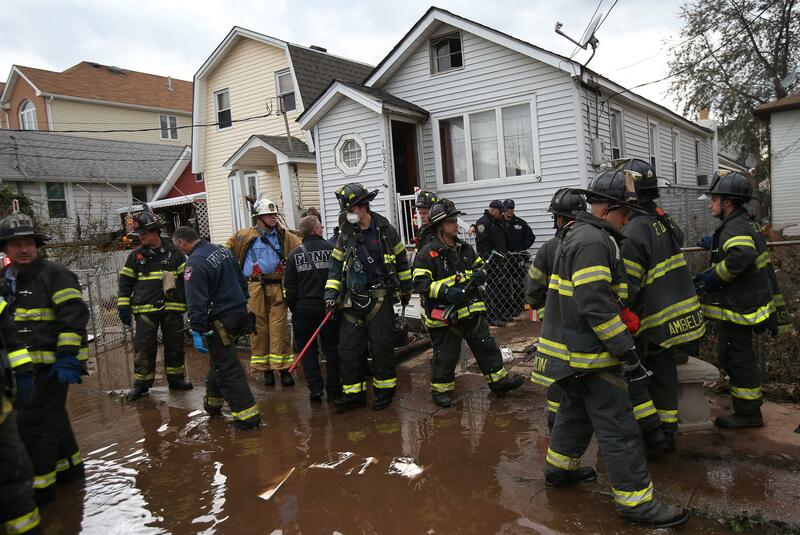 Firemen gather outside a house where the bodies of two elderly people were reportedly found on November 2, 2012 in the Staten Island borough of New York City. 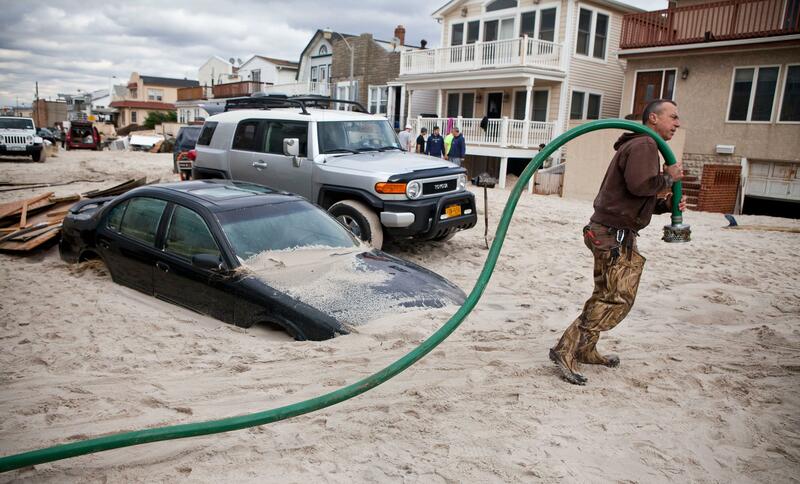 Rescue personel and police continue to find drowning victims from Hurricane Sandy four days after the storm. Meanwhile, hundreds of thousands of people in Staten Island remained without electricity in areas affected by the superstorm. 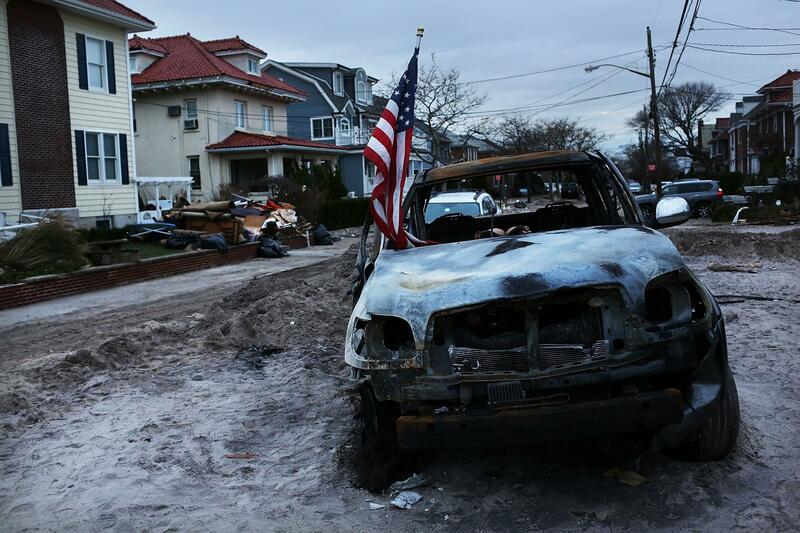 A destroyed car sits in the street in the heavily damaged Rockaway neighborhood, in Queens where a large section of the iconic boardwalk was washed away on November 2, 2012 in New York. Limited public transit has returned to New York and most major bridges have reopened but will require three occupants in the vehicle to pass. With the death toll currently over 70 and millions of homes and businesses without power, the US east coast is attempting to recover from the effects of floods, fires and power outages brought on by superstorm Sandy. 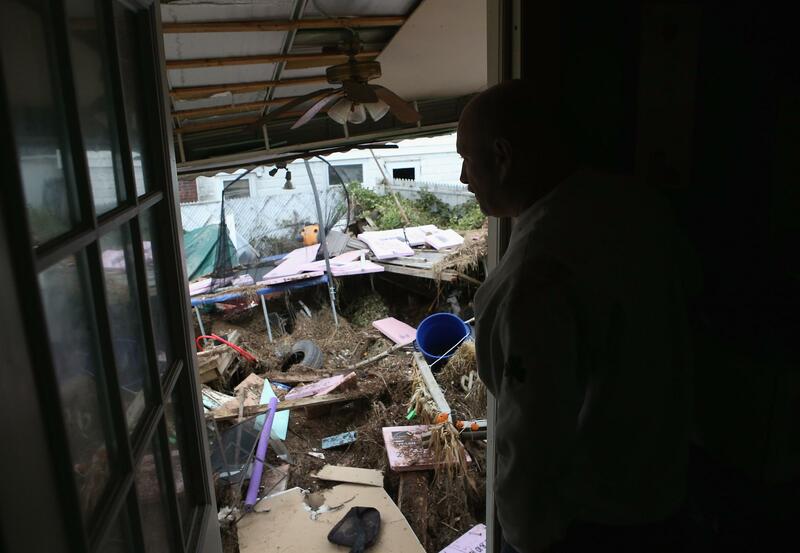 Ronald Forster looks from the back door of his flood-damaged home on November 1, 2012 in the Ocean Breeze area of the Staten Island borough of New York City. 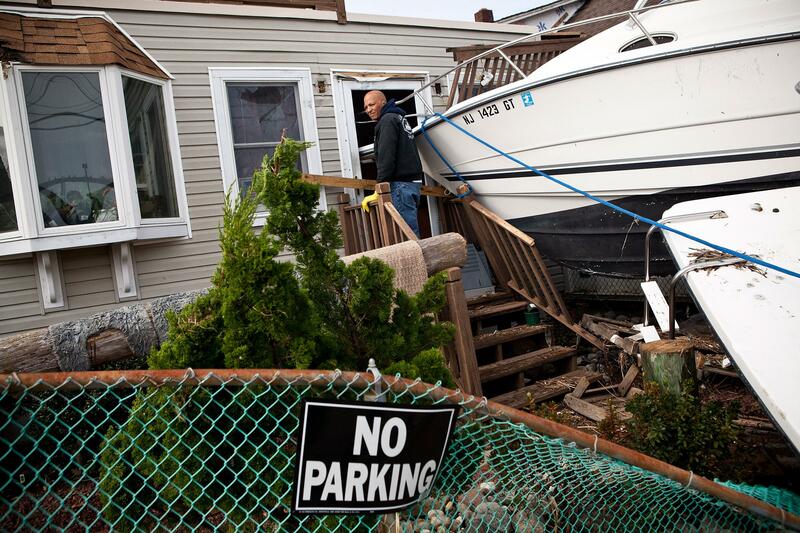 Most homes in the seaside community were inundated by the ocean surge caused by Superstorm Sandy. 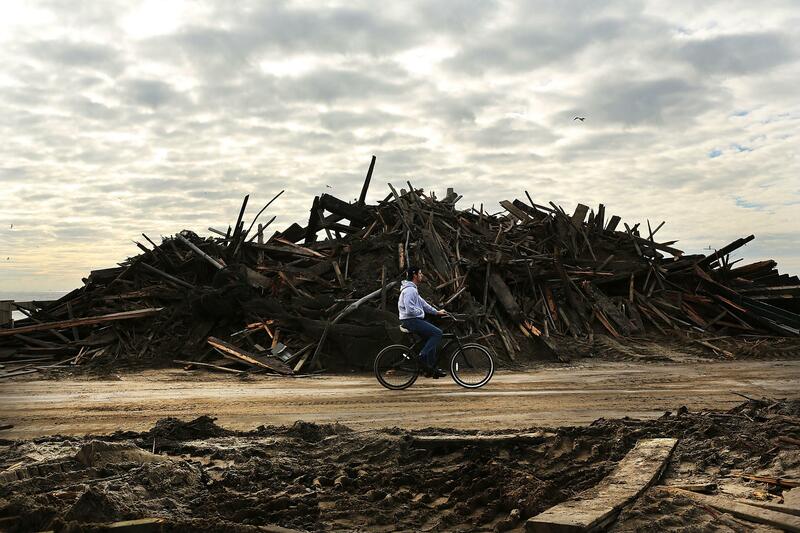 A man rides his bike through the heavily damaged Rockaway neighborhood, in Queens where a large section of the iconic boardwalk was washed away on November 2, 2012 in New York. Limited public transit has returned to New York and most major bridges have reopened but will require three occupants in the vehicle to pass. With the death toll currently over 70 and millions of homes and businesses without power, the US east coast is attempting to recover from the effects of floods, fires and power outages brought on by superstorm Sandy.